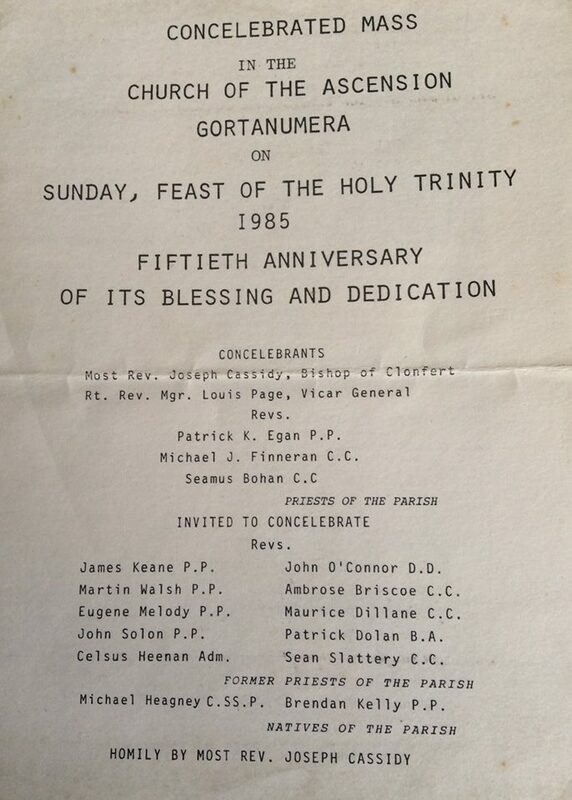 On the Sunday within the octave of the Ascension, 13 May 1934, Most Rev John Dignan , Bishop of Clonfert laid the foundation stone of the new church of Gortanumera. A year later, on the feast of the Holy Trinity, 16 June 1935, he blessed and dedicated it to the Ascension of the Lord. It was the culmination of many years of generous endeavour in difficult times by the people of the parish. Monsignor Timothy Joyce was appointed parish priest of Portumna in December 1919. 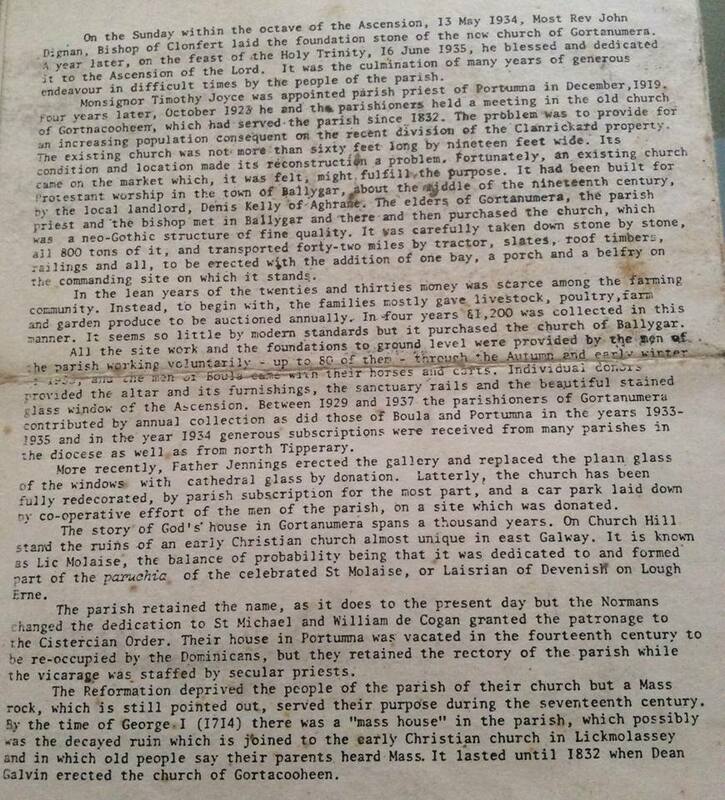 Four years later, October 1923 he and the parishioners held a meeting in the old church of Gortnacooheen, which had served the parish since 1832. The problem was to provide for an increasing population consequent on the recent division of the Clanrickard property. The existing church was not more than sixty feet long by nineteen feet wide. It’s condition and location made its reconstruction a problem. Fortunately, an existing church came on the market which, it was felt, might fulfill the purpose. 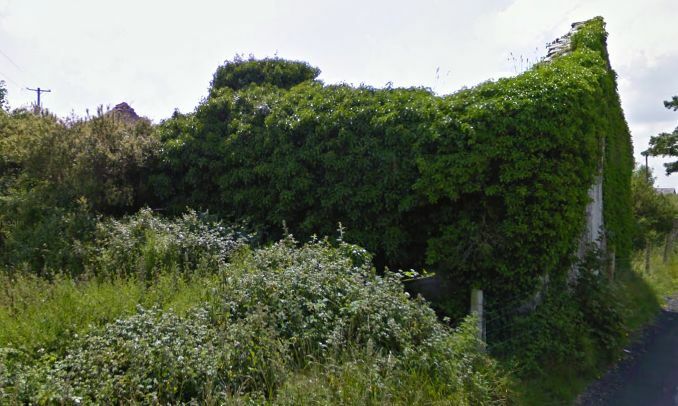 It had been built for Protestant worship in the town of Ballygar, about the middle of the nineteenth century, by the local landlord, Denis Kelly of Aghrane. the elders of Gortanumera, the parish priest and the bishop met in Ballygar and there and then purchased the church, which was a neo-Gothic structure of fine quality. It was carefully taken down stone by stone, all 800 tons of it, and transported forty-two miles by tractor, slates, roof timbers, railings and all, to be erected with the addition of one bay, a porch and a belfry on the commanding site on which it stands. In the lean years of the twenties and thirties money was scarce among the farming community. Instead to begin with, the families mostly gave livestock, poultry, farm and garden produce to be auctioned annually. In four years £1,200 was collected in this manner. 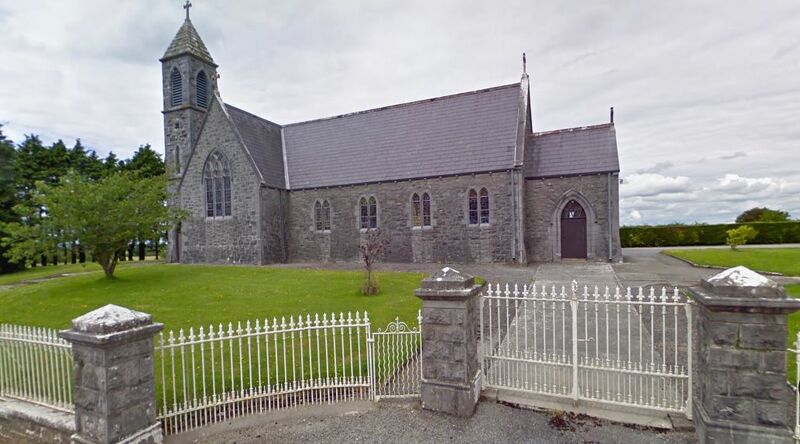 It seems so little by modern standards but it purchased the church in Ballygar. All the site work and the foundations to ground level were provided by the men of the parish working voluntarily – up to 80 of them – through the Autumn and early winter 1932/33 and the men of Boula came with their horses and carts. Individual donors provided the altar and its furnishings, the sanctuary rails and the beautiful stained glass window of the Ascension. 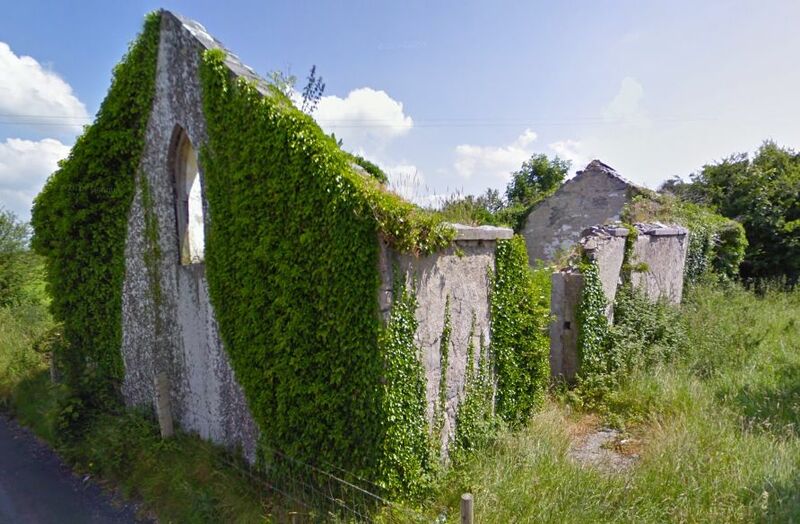 Between 1929 and 1937 the parishioners of Gortanumera contributed by annual collection as did those of Boula and Portumna in the years 1933 – 1935 and in the year 1934 generous subscriptions were received from many parishes in the diocese as well as north Tipperary. More recently Father Jennings erected the gallery and replaced the plain glass of the windows with cathedral glass by donation. Latterly, the church has been fully redecorated, by parish subscription for the most part, and a car park laid down by cooperative effort of the men of the parish, on a site which was donated. The story of God’s house in Gortanumera spans thousands of years. On Church Hill stand the ruins of an early Christian church almost unique in east Galway. It is known as Lic Molaise, the balance of probability being that it was dedicated to and formed part of the “paruchia” of the celebrated St. Molaise, or Laisrian of Devenish on Lough Erne. The parish retained the name, as it does to the present day but the Normans changed the dedication to St. Michael and William de Cogan granted patronage to the Cistercian Order. Their house in Portumna was vacated to be re-occupied by the Dominicans, but they retained the rectory of the parish while the vicarage was staffed by secular priests. The reformation deprived the people of the parish of their church but a mass rock, which is still pointed out, served their purpose during the seventeenth century. 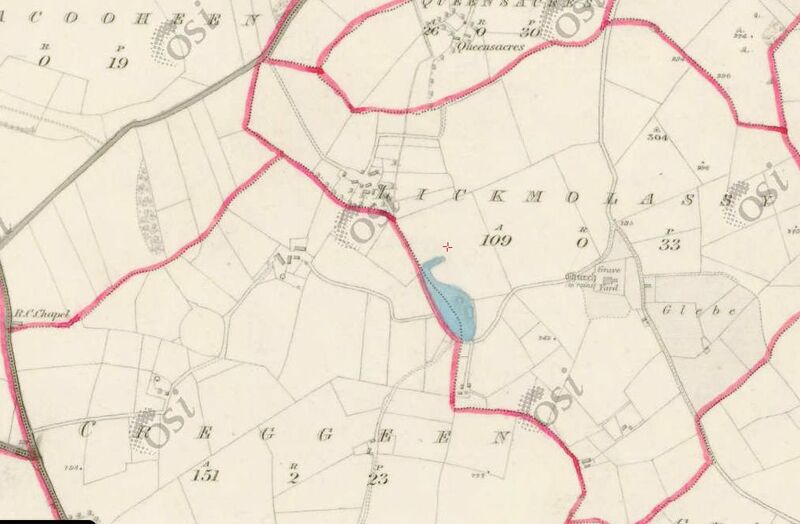 By the time George 1 (1714) there was a “mass house” in the parish, which possibly was the decayed ruin which joined to the early Christian church in Lickmolassey and in which old people say their parents heard mass. It lasted until 1832 when Dean Galvin erected the church of Gortacooheen. A con-celebrated mass was held on Sunday, Feast of the Holy Trinity in 1985 on the occasion of the 50th anniversary of it’s blessing and dedication.